I love pizza. It is hands down my favorite food and I could probably eat it every day. I mean, the topping and crust combinations are endless so that you would never get bored! But...I've been trying to cut back on carbs so we tried this at my parents last weekend when I was home. Everyone knows my mom makes the best homemade pizza in NE Iowa but I have to say, this variation did not disappoint! Preheat the oven to 400 degrees. Beat the eggs and blend in 6 ounces of cheese. 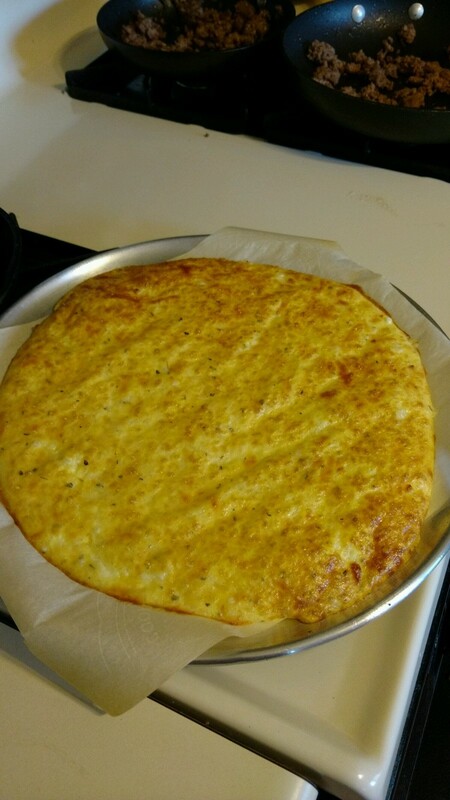 Spread the cheese and egg batter on a round baking sheet lined with parchment paper. Sprinkle with garlic powder and Italian seasoning. Bake in the oven for 15 minutes until the pizza crust turns golden. Remove and let cool for a minute or two. Increase the oven temperature to 450 degrees. Spread on sauce then top with ingredients of choice. 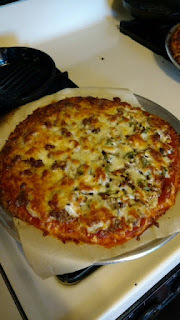 We did one sausage and pepperoni and the other we added onions and green peppers. Top with shredded cheese and bake for another 5-10 minutes or until the pizza has turned golden brown. Remove from oven, cut and dig in!!! I thought this pizza was amazing. 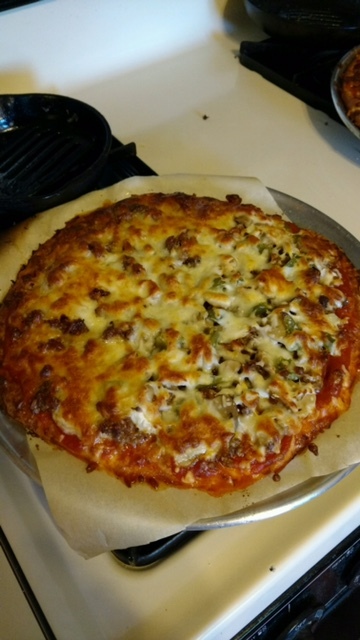 Sure, it’s not a deep dish Chicago style pizza but the flavor is great and you skip the carbs of a thick crust. And it’s much easier than the cauliflower crust/breadsticks I’ve tried before. I would opt for this or the low carb gluten free thin crust recipe!